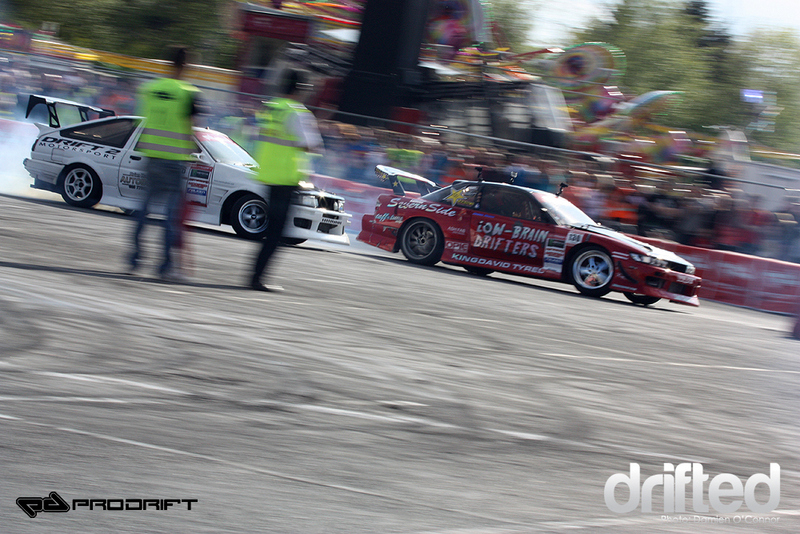 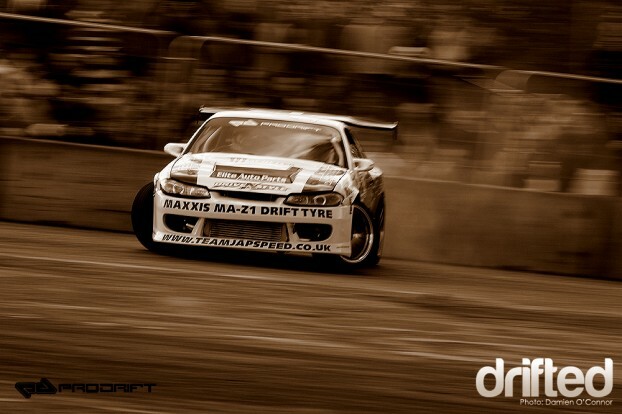 It’s fair to say I’m still pretty shattered from what really was a spectacular weekend’s drifting in the opening round of Prodrift’s 2011 season. As I descended on my two hour trip early Saturday morning to the Co.Clare venue dark clouds hung overhead, I was getting flashbacks of the washout at this venue two years ago and really was not looking forward to a return of the same, but almost as if the Drift Gods were looking down on us from above, sun broke though in Ennis, Co.Clare and blistered over a packed crowd for the entire weekend. 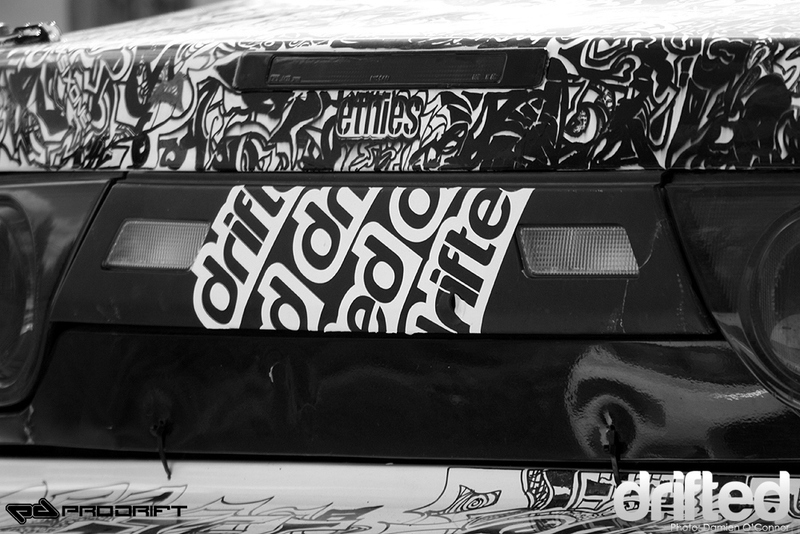 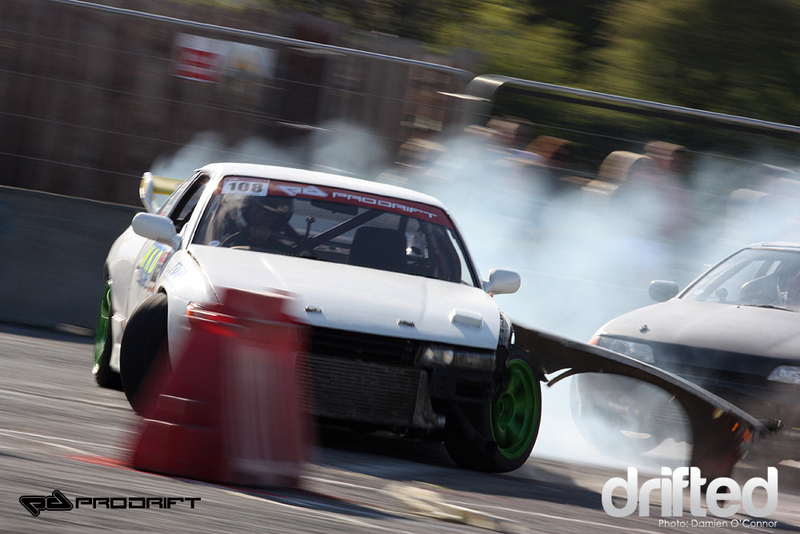 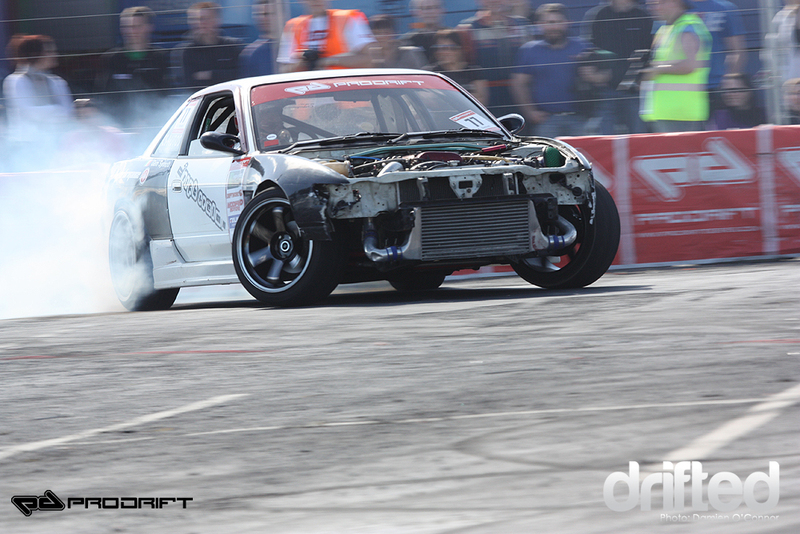 The first round of drifting is always a highlight for me, you get to see some old faces, some new faces, but also you get to enjoy all the new metal which sweat and tears have been poured into over a cold dark winter. 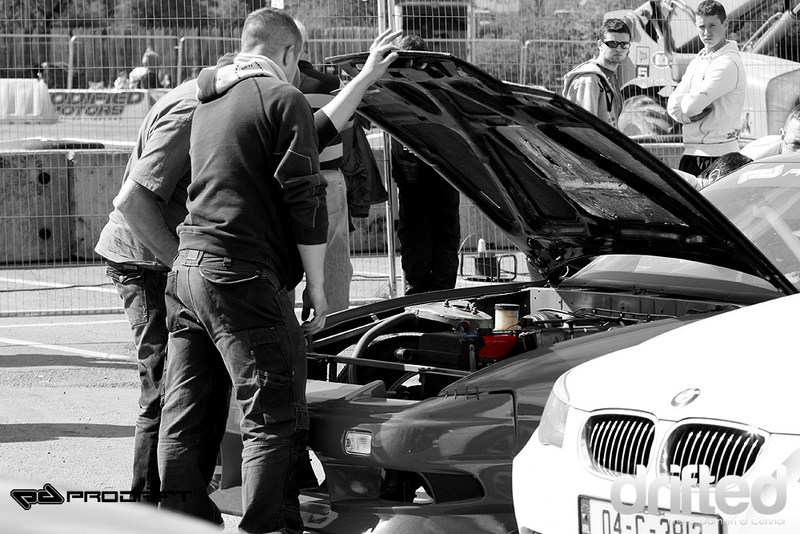 It’s every man for himself to find spot to see the action through the big crowds, the “Good Luggage Crew” MX-5, as good a spot as any it seems. 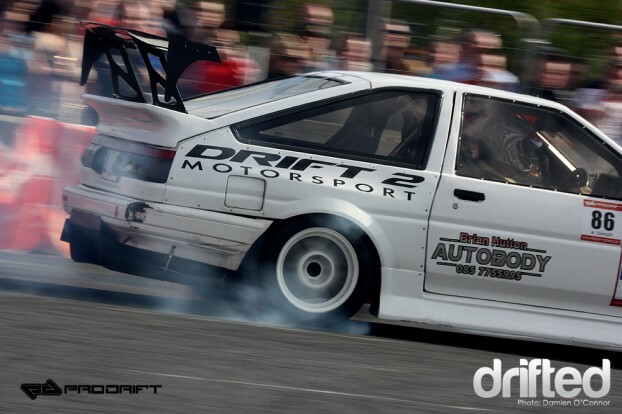 The MCN Sport Need for Speed AE86 was definitely a car that captured huge interest as it rolled out of the truck with a really distinctive note from that rotary engine. 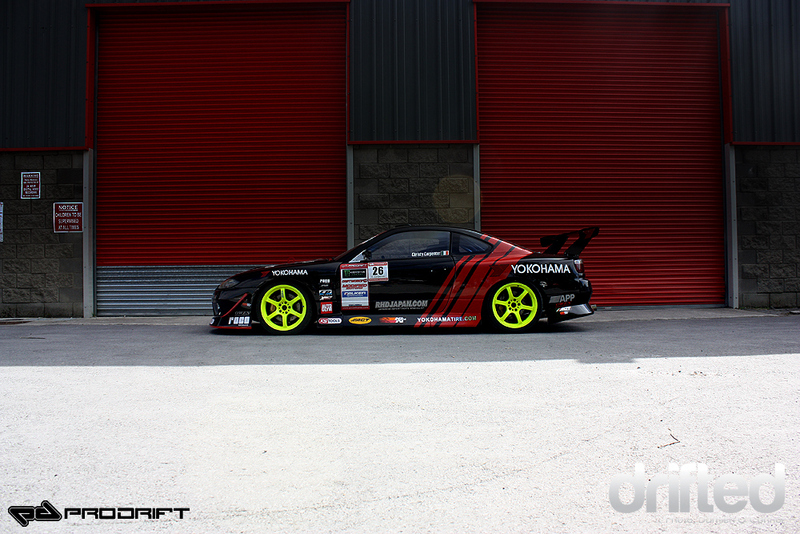 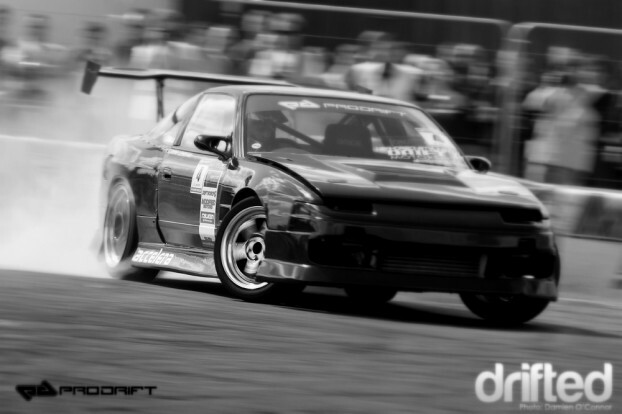 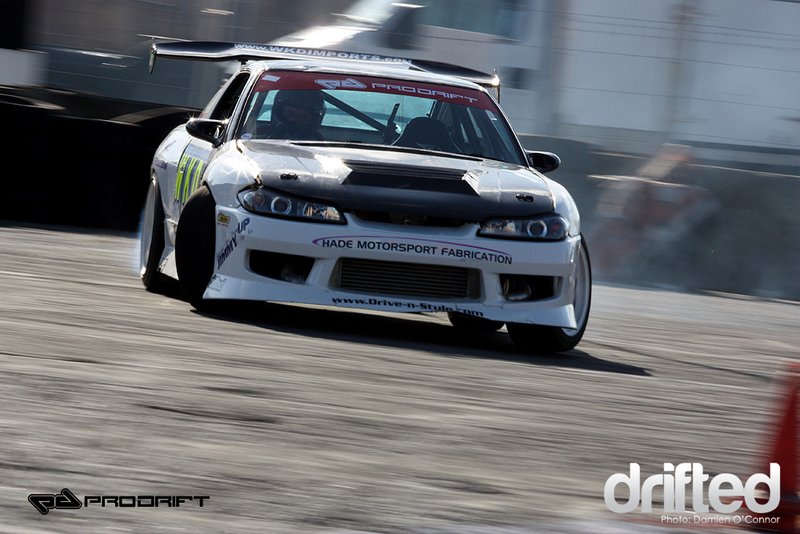 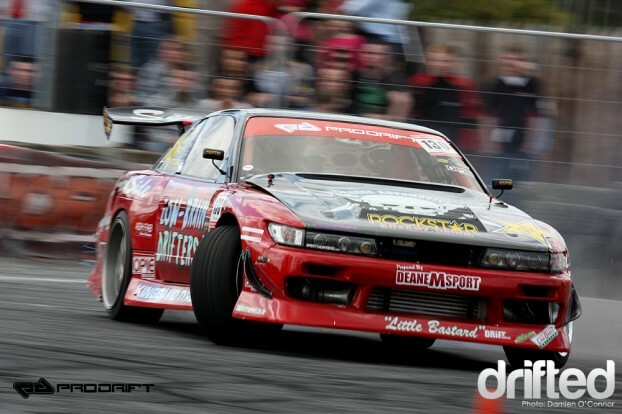 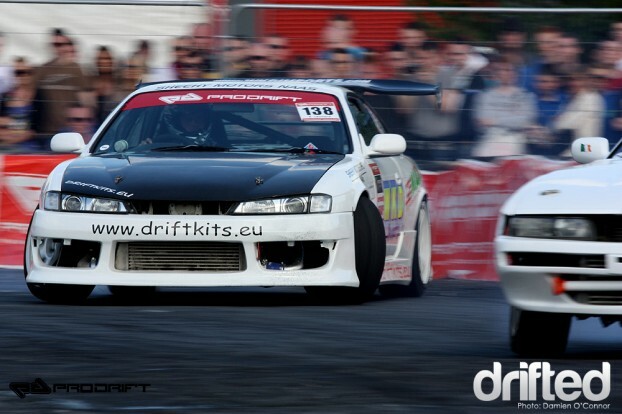 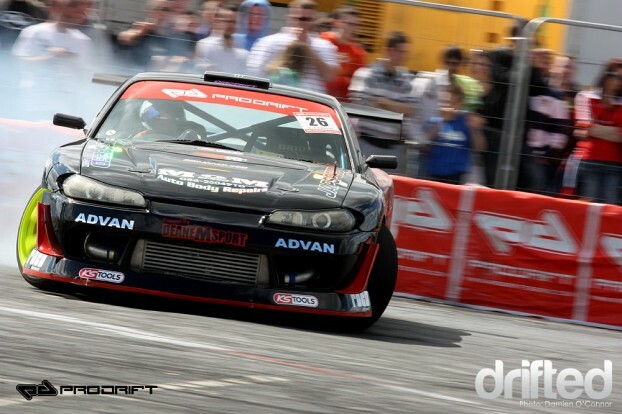 Another notable fan favourite from the weekend was Christy Carpenter’s Yokohama sponsored and new look 1JZ Nissan Silvia, stay tuned to Drifted as we bring you a closer look at this car in the near future. We like the inventiveness of where this driver tagged his favourite blog site! 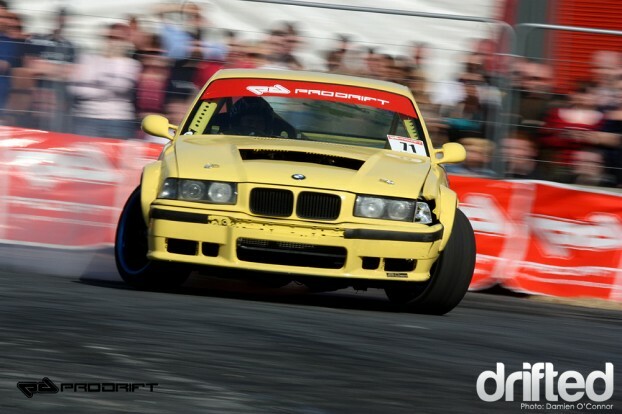 John Paul McCarthy, gave the paying fans a pure thrill with his amazing sounding V8 BMW E36 Coupe. 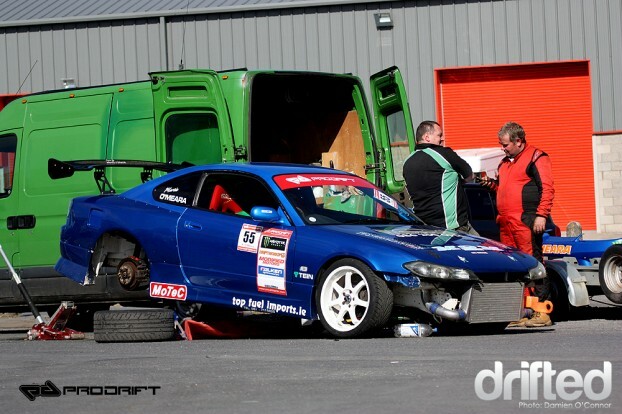 Let’s play spot the 1J, although not completed for Rd1, we look forward to seeing Damien Mulvey in action in his new JZ powered S-Body. 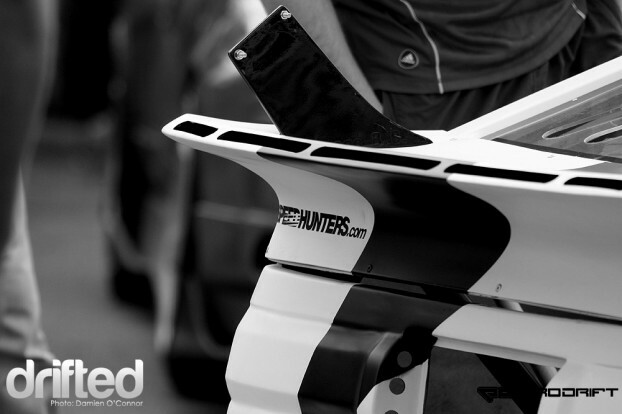 Some members of the Chambers Performance and Nitro Tour crews check out the new metal on show. D-Mac fresh home from Formula D action to lend an experienced hand where needed. 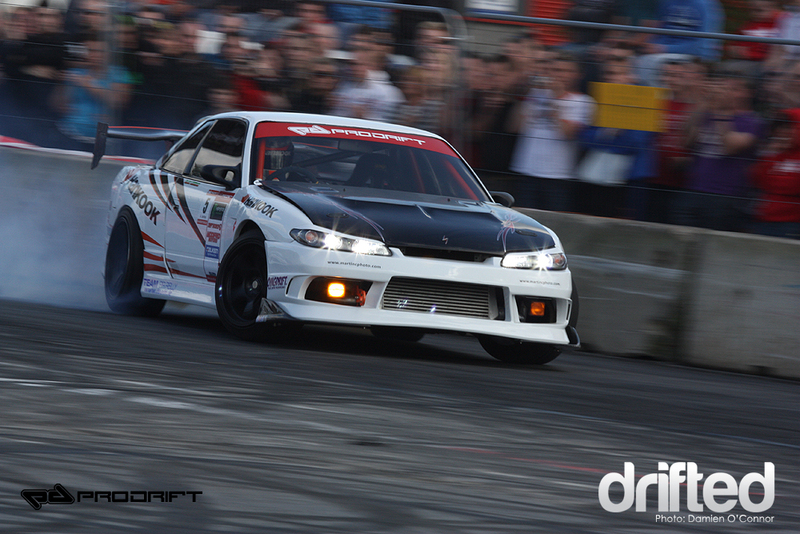 A nice shot showing the sleek design of Nissan’s S15 headlight, damn I’m totally out of focus here, must practice more Damien ! 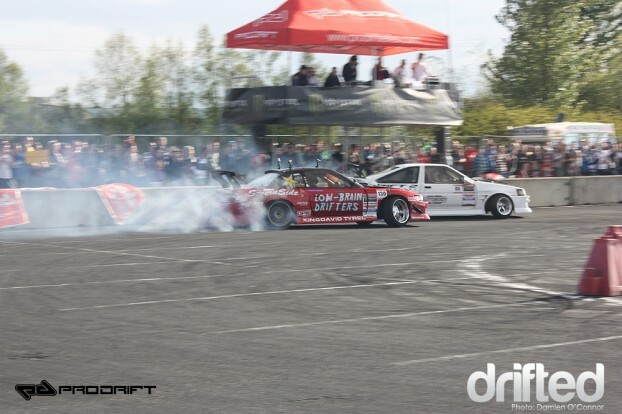 Competition got off to a fierce start on Saturday, drift practice days in Mondello Park and Portlaoise really seem to have given less experienced drivers a real edge coming into competition on the opening day. Martin Ffrench’s recent absence from Irish drifting would mean he would start the day as a Non Seeded pro, unfortunately for Martin he spun out in battle against Michael Sheehan and narrowly missed out on the top four spot he needed to cement a place in qualifying for Sunday’s Pro competition. 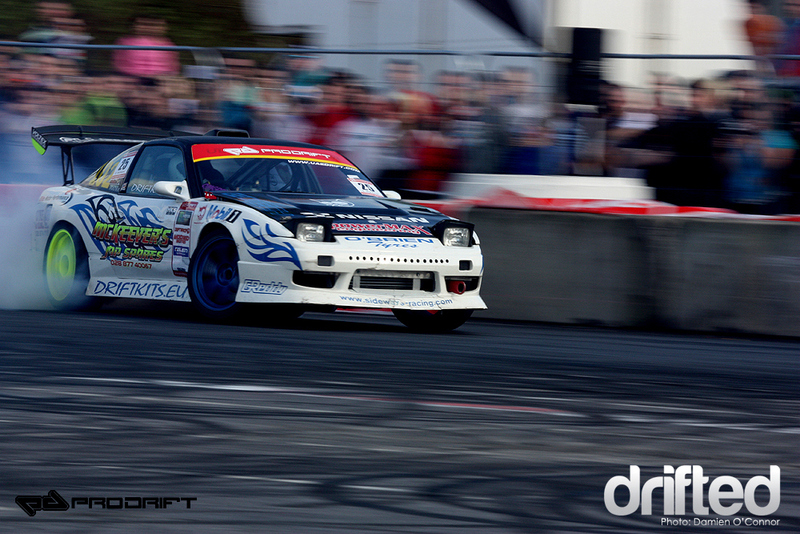 Meanwhile 15 year old Duane McKeever was on flying form as seen above. 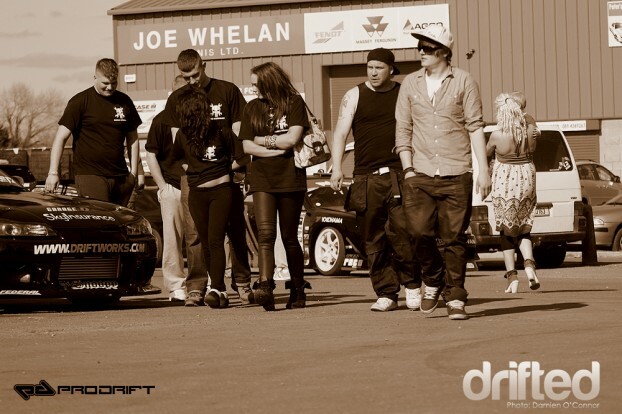 WKD team boss Wesley Keating had no such misfortune as he tore up the course throughout the day taking 2nd place in the Non Seeded category, Wesley went on to qualify for the Top 16 of Pro competition the following day which I’m sure the Carlow based driver will be delighted with. Nick Queally is definitely a name that Prodrift fans will now have on the tip of their tongues, Nick won the Amateur class for the round and also went on to qualify for the Top 16 in the Pro Class the following day, we expect to see great things from Nick, the Dungarven native throughout the rest of the season. Jay Rockett and Ciaran ‘Gem’ Synott are fastly gaining reputations of high order with some mega entries. We last saw Gem in action in Lousada, Portugal last year. 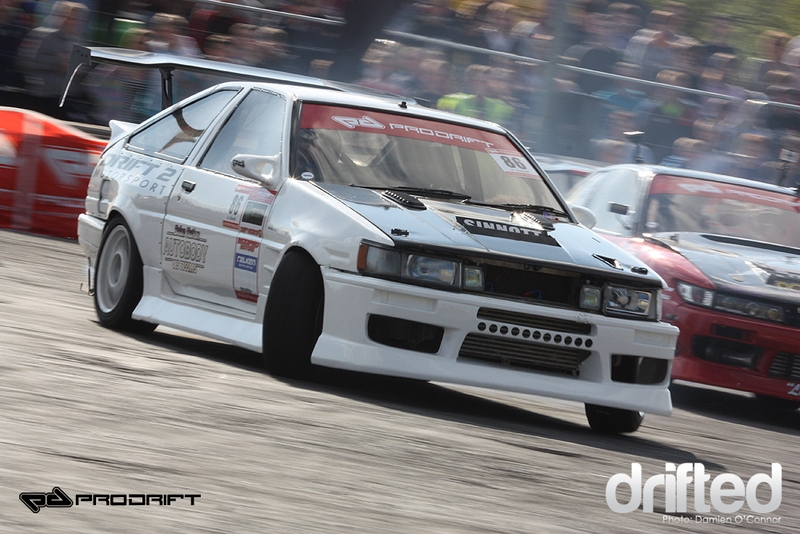 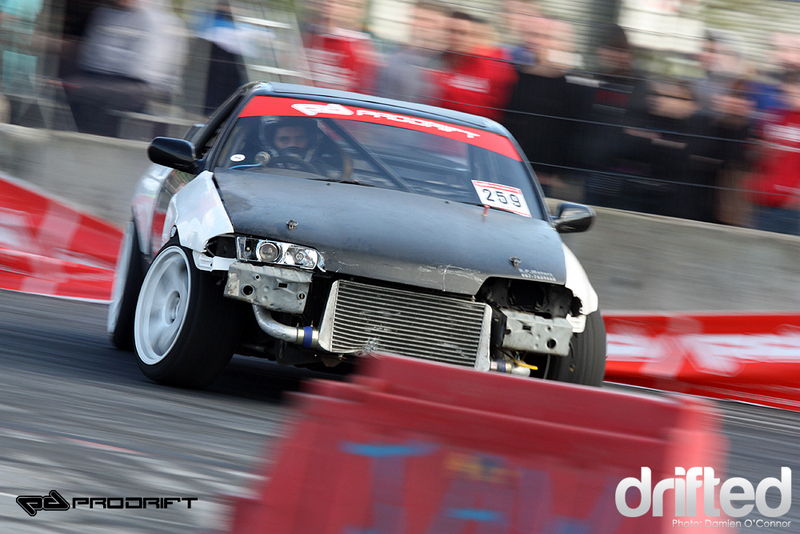 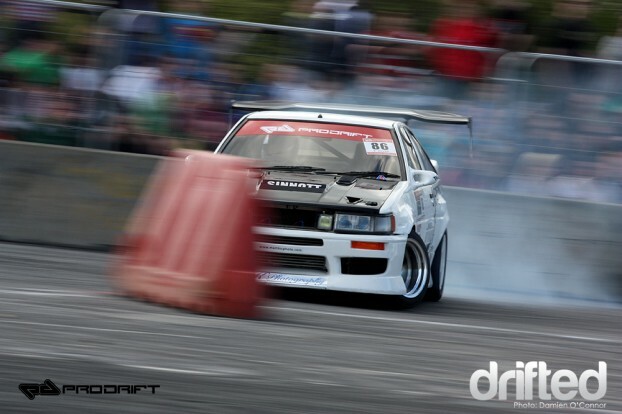 Duane McKeever show’s us how you run the wall under huge pressure from Carparts.ie sponsored Sean Manning. 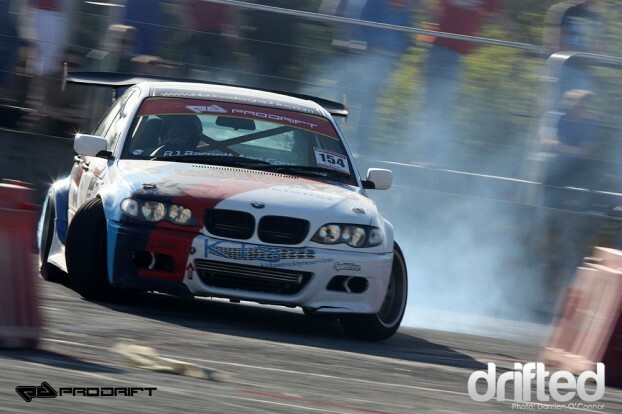 If Kevin Kindregen picks up where he left off next round I feel he will be picking up a similar reputation as our big entry men above are ! 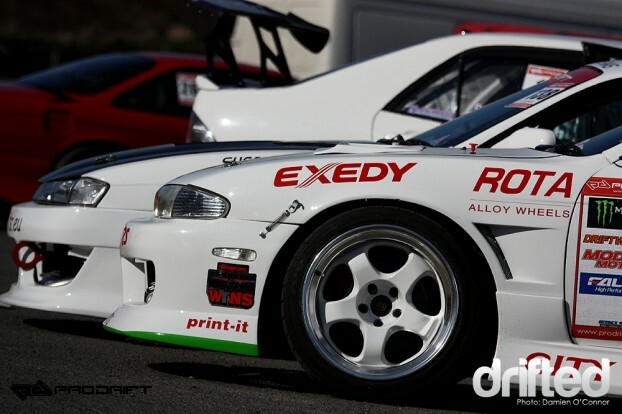 However, Rob Barnett put a close to business and to all rivals on Saturday evening as he impressively picked up the Non Seeded Pro win for the round in his Nissan RB powered E46 BMW saloon. 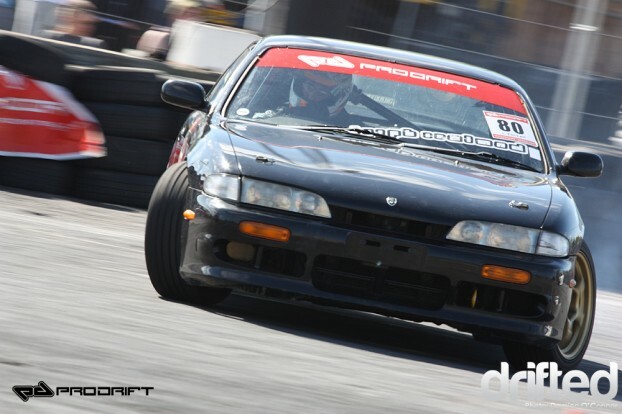 A short sleep followed that night and we were back in action on Sunday for the Pro Seeded class, early on it was evident that drivers who were running a longer ratio differential were changing out for a 3.7 or 4.1 ratio to suit the technical course. 2010 Champion James Deane enters driving the on loan car of Low-Brain Drifters, James such a talented driver didn’t appear to have too many issues adapting. 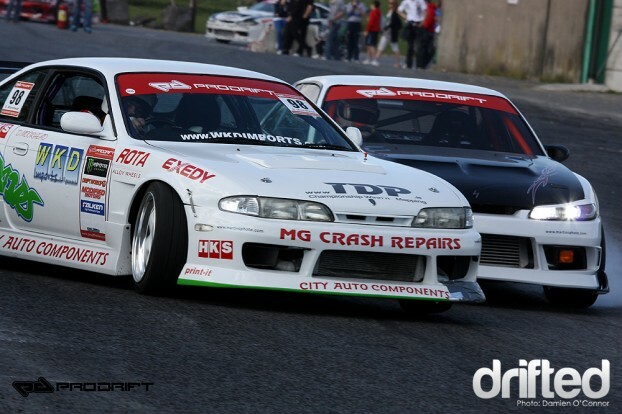 Dan Moorehead in his first day of competition in the MG Crash Repairs S14 Silvia. Christy Carpenter uses all of the power from that JZ Toyota motor to break the traction on his new ultra sticky A048 Yokahma Advan tyres. 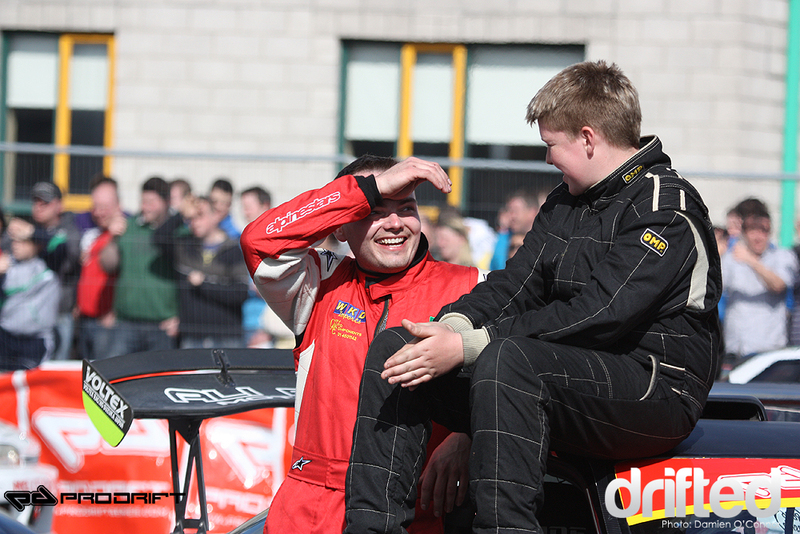 I’m sure Christy and his new sponsor were delighted for finish 3rd on the podium on the Pro Class division for the day. 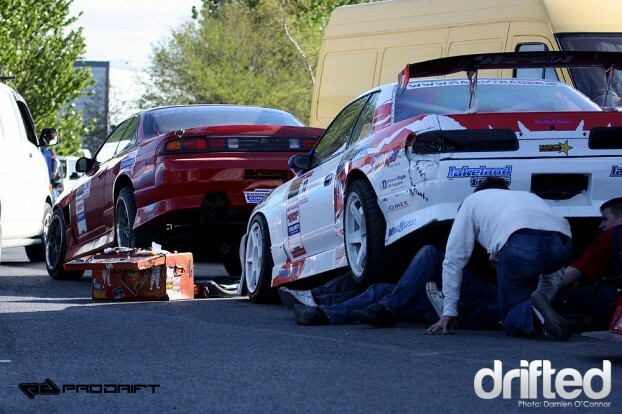 Gavin Lenihan must have been doing some serious fighting with his brother Alan on bottom for garage space throughout the winter as the brothers turn out beautiful examples for the new season. 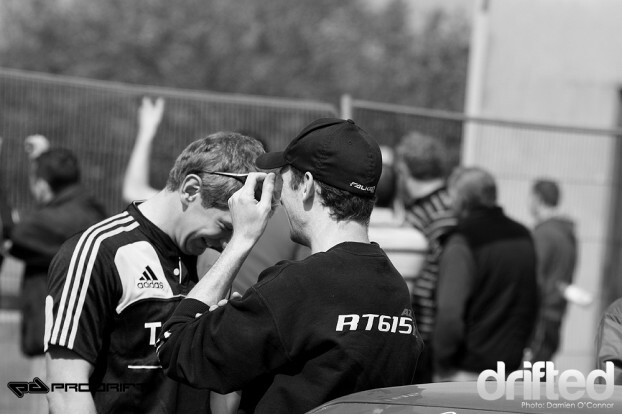 Dan Moorehead and Duane McKeever enjoy some banter ahead of Top 16 Pro Competition. 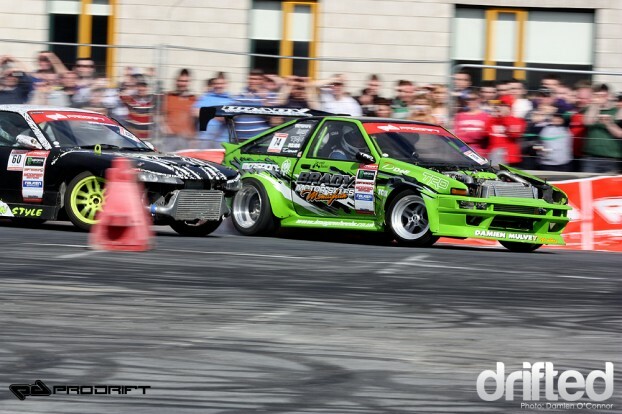 Nigel Colfer, fresh off a really hot winning Super Lap, looked like he could really go all the way, an EPIC battle between himself and Chris Brady opened up the day and it really was a joy to watch, you really could have ran these drivers all day with little or nothing separating them with no driver giving an inch , Chris Brady’s AE86 is testament to this, the judges did favour Colfer in the end to progress. 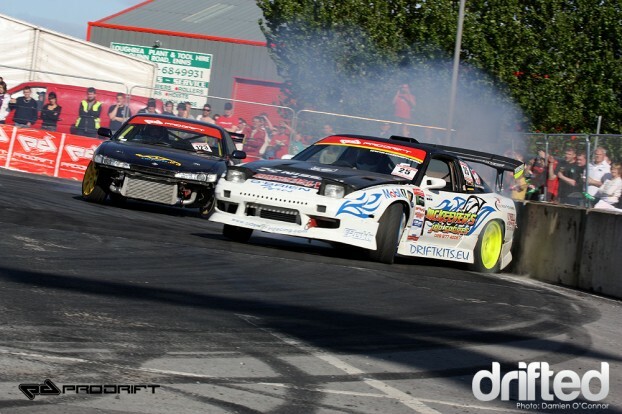 Barry Leonard, Non Seed Pro champion from 2010 looked really like he had years under him in his promoted Pro Class yesterday. 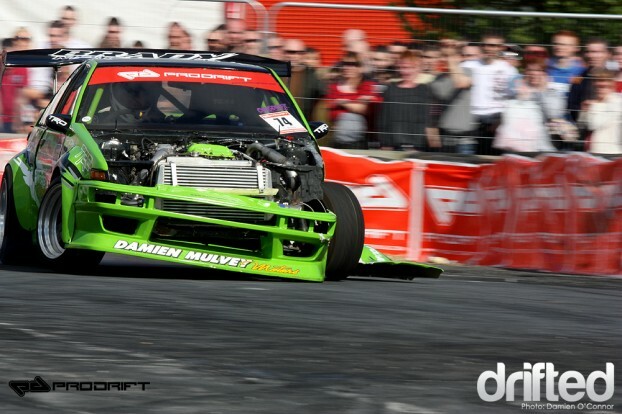 Alan Lenihan in the chase car applying some real pressure to Dan Moorehead. Shane O’Sullivan seemed to enjoy some quality seat time in his new 2011 car, none other than the RB25 powered Japspeed motor. 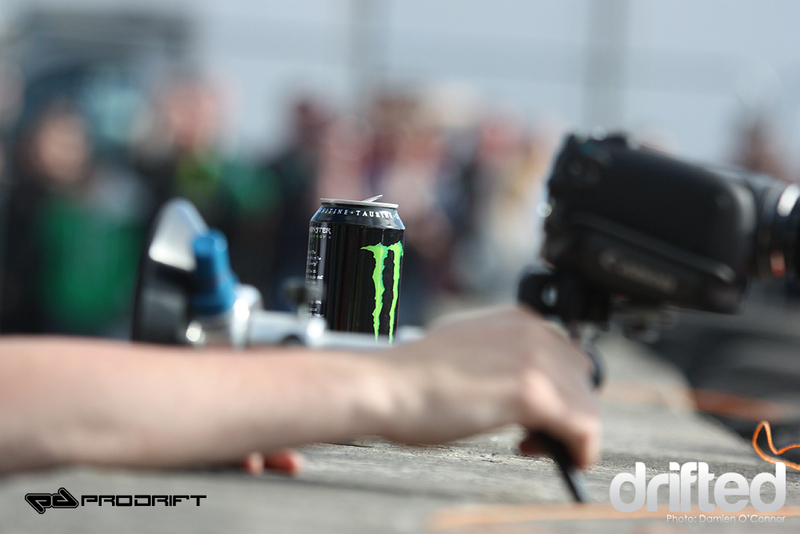 Monster Energy, fueling the media of Prodrift, Pat from Cezeli Productions has a sneaky can on-hand. It really was a case of saving the best for last, Alan Sinnott in his trusty SR20 powered motor would face James Deane who was really the on form driver of the day, nailing every entry and clipping point, again just like how we started the first battle of the day there really was nothing to separate the pair, but it was clear to everyone, Sinnott’s time had come, Alan is a driver who has been there or thereabouts for the last couple of season’s in Prodrift and has been in contention for overall championships on the final rounds, but has actually never won an event, well it was his day, and he took the opportunity with both hands, really a decision that was so close in the end, but a justified one I feel. 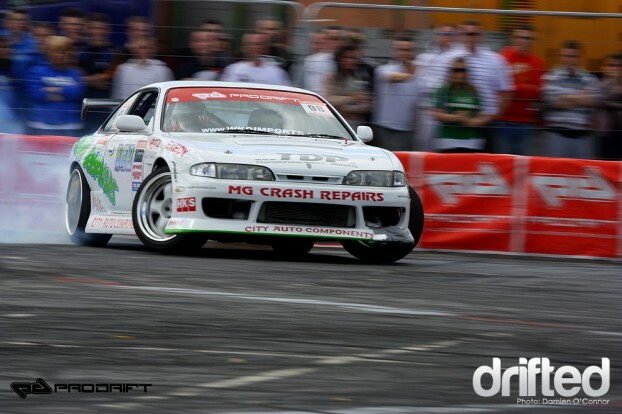 Alan Sinnott takes top honours in the “Return of Ennis” will this be the kick-start Alan needs to win an overall championship? Only time can tell.